le hook is so much more than just an incredibly strong keyring. You can use it to connect your flashlight to your rucksack or belt. 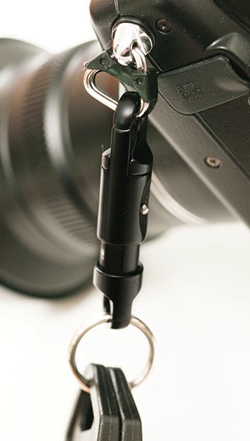 You can use it to connect your press pass to your camera. You can use it to connect your wallet to your chain. You can use it to connect your keys to your trousers or bag. You can use it to connect your GPS to your rucksack. You can use it to connect your Swiss Army Knife to your flashlight. You can use it to connect your Passport holder to your jacket pocket. You can use it to connect your Mobile Phone to your trousers. You can use it to connect your Motorbike Keys to your Helmet. You can use it to connect your keys to just about anything. You can use it to connect your speed bar to your paraglider. You can use it to connect just about anything to well, just about anything else.